Ready or not, the year end holidays and 2017 are just around the corner. That means Snowflake Lane, lighted wreaths on Main Street and the Bellevue Magic Season events are just a month away. One of the season’s favorite events, the outdoor skating rink, will temporarily be relocated to Ashwood Park this year due to construction at the Downtown Park. The skating rink will be open November 25th through January 8th with food and beverage concessions, music and special events. More information about transportation and parking is available from the City of Bellevue or Bellevue Downtown Association. The library will provide complimentary parking n its garage. 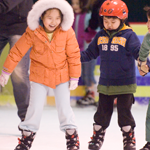 Admission is $12 for ages 9+ and $9 under age 8 which includes skate rental. Cash, credit and debit cards accepted. This entry was posted in CITY LIVING, EVENTS, lifestyle, recreation and tagged CITY LIVING, DOWNTOWN BELLEVUE, entertainment, EVENTS, lifestyle, parks, recreation by Robin Myers. Bookmark the permalink.